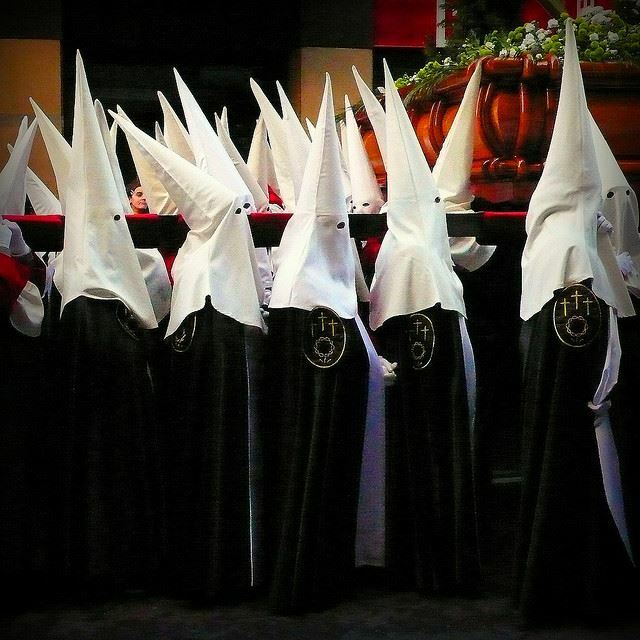 What Happens During Semana Santa in Spain? The cofradias are the brotherhoods or groups that co-ordinate and participate in the processions. These are lay organisations that spend 12 months preparing for Holy Week. As you read this, you can be sure that somebody somewhere in Spain is working to prepare for Semana Santa. 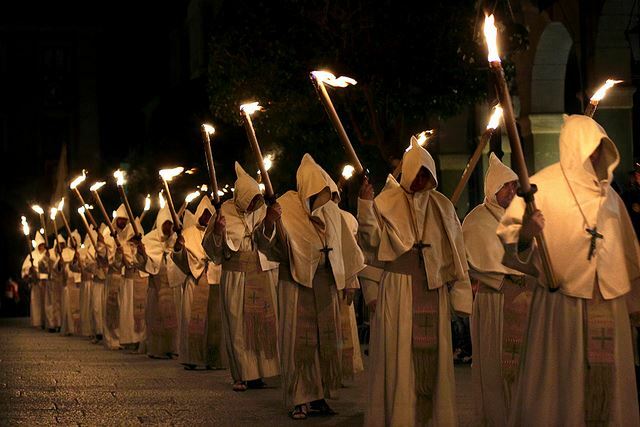 The nazarenos are the people that walk in the procession – the name comes from the robe they wear. Although the first thing that you will have noticed is the conical hat with its cut-out eyes. 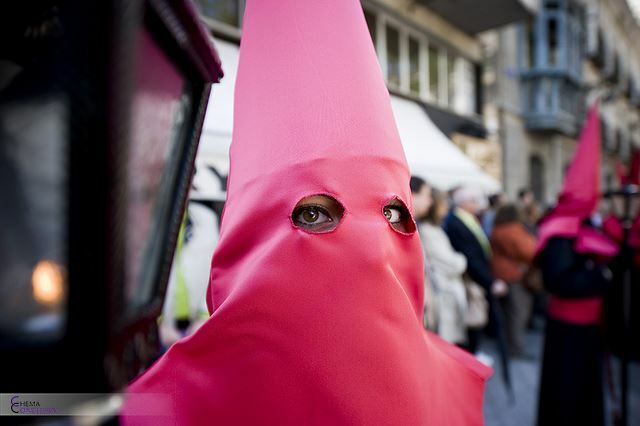 It’s called a ‘capirote’ and is not at all sinister. Its design is intended to bring its wearer closer to heaven. You might not notice it immediately but some of the nazarenos go barefoot. You may see even see some of those barefoot wearing chains or shackles. Most will carry a candle although some will be carrying crests and even huge crucifixes. There is no age limit. You see the sway before you realize what is in front of your eyes. And that’s when you appreciate the brute force of those ‘costaleros’ carrying the thrones. The weight and distance walked varies from day to day and place to place but we’ve seen some ‘costaleros’ carrying 50kg each. Not easy on a narrow cobbled street. One of the largest thrones, in Malaga is carried by 200 men, each shouldering 23kg over 4km. (Having specified men, we should say that some cofradias have female costaleros). 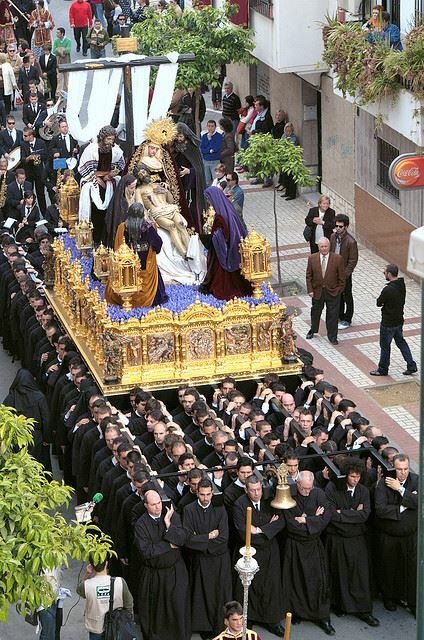 One of the longer routes must be the 12-hour procession in Granada where each costalero is shouldering 50kg. We expect there are many changes made during the day. There are two types of thrones – the ones where the weight is carried on the shoulder and for larger or heavier structures the carriers go inside the base. Of course, not all brotherhoods will carry their thrones. Some are taken on trolleys, making for a bit less of a spectacle sometimes. For the lifting variety, training begins at least three months before Easter and some groups will put in practice sessions all year long. We read that it’s not just about strength but endurance, co-ordination and a sense of camaraderie are essential too. And no matter how much training each group puts in, the strain on the calves, kidneys and arms is guaranteed. See this video from Cadiz which takes us inside the wooden platform to really appreciate the physicality involved. It must be like running a few marathons back to back. If you think the video is good (which it is) you should see it in person. This video from Biar in Alicante shows the shoulder-held pasos, which are a little lighter to carry, but no less dramatic. You can also get a feel for the marching bands and the role of percussion in the first two minutes. It’s another beautifully-shot video. When you get beyond the pain of those carrying the weight, you begin to notice that many of the figures of Christ and Mary are dressed in extremely elaborate clothing. The embroidery work on the clothing worn by the Virgin Mary is extremely intricate and many of the ‘mantos’ or long capes date back centuries. In cities such as Malaga and Seville, you’ll find a number of artisans that not only create new pieces but restore the figures and fabrics for the existing pieces. If you like embroidery, you’ll enjoy these photos of the ‘mantos’ used in Seville. Take a look at the facial expressions of the statues. And look at the Virgin Mary’s jewellery which are made from precious metals and stones such as diamonds that reflect the candle light beautifully at dusk. The floral displays are also very important to the cofradias – who will use colour to great effect – for example a bed of red carnations to symbolise the blood of Jesus Christ. Music is an essential element to the ‘pasos’. The marching bands play a soulful music with drums and cornets being the predominant instruments. The beat of the drum is very useful for the ‘costaleros’ timing. And keep an ear out for ‘saetas‘ which are primitive sounding songs sung unaccompanied that show devotion to a particular image of Christ or the Virgin Mary. You can see the 10-year old Pilar Bogado sing a saeta to the Virgin Maria de la Amargura in Huelva here. In case, all that wasn’t enough drama, along with the smell of incense and candle wax, you will feel the heat and glow of the candles at the after-dark processions. The people taking part will really capture your attention too. The Hermano Mayor who organises everything. The mayordomo or butler who taps the throne to indicate when it needs to be raised. And the women dressed in black wearing the high peinetas. The comb and veil is black all week long until Easter Sunday when the ladies switch to white. The final element of the procession is the crowd. In Seville, you will see people shed tears as the procession passes by. You’ll hear “guapa” or “guapo” begin called out to the statues as onlookers praise the work of the cofradias. You sense the emotion of the crowd – especially when the ‘costaleros’ go by. It’s hard not to be moved by their strength and passion. Even in the most informal or simple of processions, the sense of tradition will leave its mark on you and those around you. That said, you’ll also find plenty of people just getting on with their day on the streets away from the route. Where Are The Best Semana Santa Processions in Spain? The most popular ‘pasos’ are in Seville and Malaga and are an extraordinary spectacle but you’ll need a lot of planning or insider help to get a good view of the proceedings. 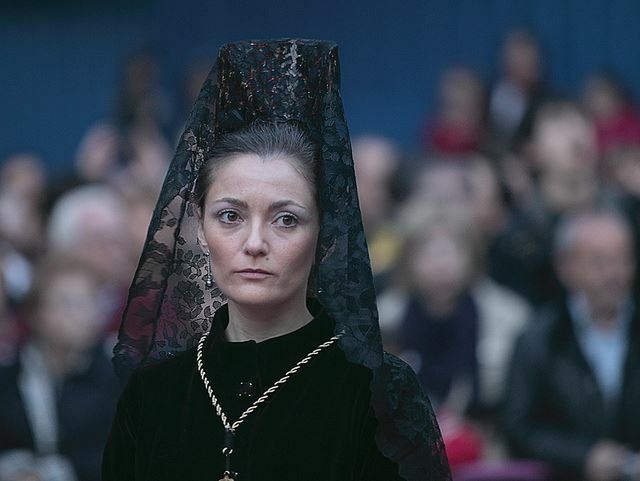 Seville is home to more than 50 cofradias! To get a sense of the scale of its processions, have a look at this short video below to give you an idea of the numbers of attendees as well as the atmosphere. You need to be really organised if you want to secure good views of the processions in Seville but if you do, you’ll truly feel like you are in the epicentre of the Spanish Semana Santa. Malaga also has a great tradition in processions. It’s been in the international limelight of late because the Spanish actor Antonio Banderas is a member of the Cofradias Fusionadas. Banderas and you can see him here in 2013 with the brotherhood. Malaga’s processions are very popular, very lively and quite different to elsewhere in Andalusia. And in between the ‘pasos’ you should try visit the changing of the Spanish Foreign Legion guard at the Santo Domingo church. If Easter is approaching and you want something more intimate, we recommend visiting the smaller cities in Castile such as Zamora, Leon or Valladolid where the procession will practically brush past you. That’s when you can really hear and see the pain and strain involved in carrying the gilded thrones with life-sized statues. And smell the incense and candle wax. Why not see the pasos in Zamora on Easter Thursday and enjoy a traditional piping-hot garlic broth in the early hours of Good Friday? Or see the Salamanca processions that date back to 1240! The processions in Castille are generally quite solemn but are usually very elegant. Although it’s rarely quoted as a place to see processions, you can experience Semana Santa in Madrid and again, with some forward planning, you can find yourself right up close to the ‘pasos’. 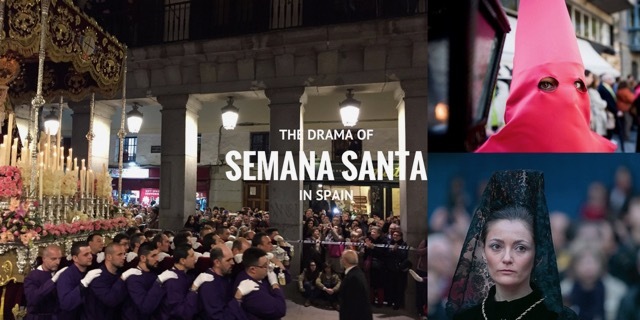 The North of Spain, where we are based, isn’t associated with any of the big Holy Week processions – although there is the complete re-enactment by locals of Christ’s final hours on Good Friday in Castro Urdiales, Cantabria – which attracts the national media. The most unusual event in the North is probably the Picaos in San Vicente de la Sonsierra in La Rioja. As you can see above, it’s where men who wish to make penance publicly can do just that – although their faces are masked to preserve their identity. 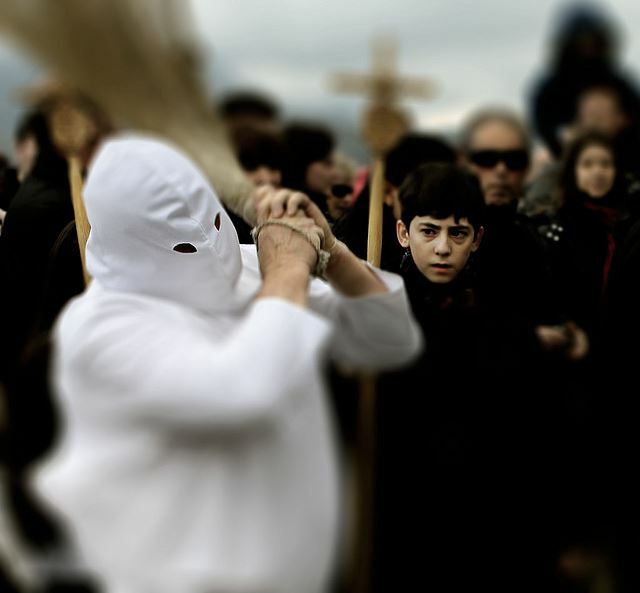 If you are interested in this aspect of Semana Santa, you should consider the ’empalaos’ in Valverde de la Vera in Extremadura also (see image above). Spending Semana Santa in Spain? If you want to experience Spain at Easter, we can put together an itinerary and ensure that your accommodation is convenient to – but not necessarily on a procession route – so you can get a great night’s sleep. We can also recommend which of Spain’s cathedrals, monuments & museums are nearby and give you some tips on other traditions specific to the area you are visiting. You may wish to add-on another aspect of Spanish culture and heritage for example experiencing the Spanish Camino or touring Gaudi’s Barcelona including the spectacular Sagrada Familia. Wherever you are this Easter, why not enjoy a taste of Spain with a freshly-made torrija which is a traditional Easter pastry (here’s a simple recipe video) and as you savour this delicious sweet treat, start planning your next trip to Spain! Posted in Cadiz, Cantabria, Castilla Leon, Festivals, La Rioja, Malaga, Murcia, Popular Posts, Seville and tagged Alicante, Antonio Banderas, Cadiz, candles, capirote, Castille, Castro Urdiales, cofradias, costaleros, crucifix, drums, Easter, Easter Sunday, empalaos, Good Friday, Huelva, incense, itinerary, Leon, Malaga, mantos, nazarenos, Palm Sunday, pasos, peinetas, penitents, picaos, Processions, route, saeta, San Vicente de la Sonsierra, Semana Santa, Seville, Spain, Spanish Foreign Legion, Valladolid, Valverde de la Vera, Zamora.